Churro lightly dusted with sugar, cinnamon, bit of honey nut cereal & infused fresh milk. Be the very first to try, Churrios; from the creators of The Vaping Rabbit and Milkman. This fluffy, warm, fresh out of the fryer churro is lightly dusted with sugar, cinnamon and washed down with a sip of honey nut cereal infused fresh milk. It's another tantalizingly complex vape that bridges the gap between breakfast cereal flavors and dessert flavors with unbelievable expertise that will surely keep us coming back for dos más. Churrios eJuice comes in 0mg, 3mg and 6mg. 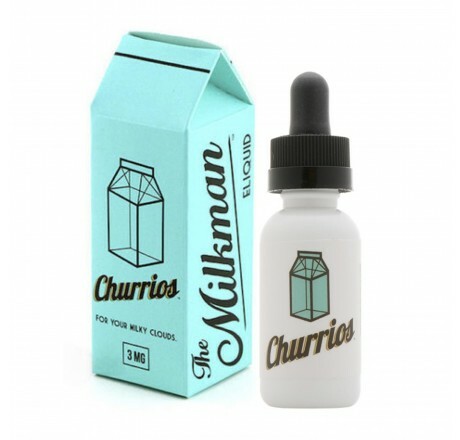 Churrios eJuice comes in 30ml bottles.